I posted back in January about finding Sima for the boys to have a kid-friendly horse. We did a three month free lease to make sure that he was the right horse for us (and that his owner, who loves him dearly, felt he was going to be the right semi-retirement home for him). I think everyone involved has been thrilled with the situation, and this week we are making it official. Sima is enjoying a slower, rural lifestyle. He no longer is part of a show barn life, or spending his weekends doing eventing. He has fully embraced this muddier, lazier way of living. The boys adore him. He's a gentleman for their rides. They are practicing the basics right now, like trying to learn how to post to the trot. And I enjoy him, too! 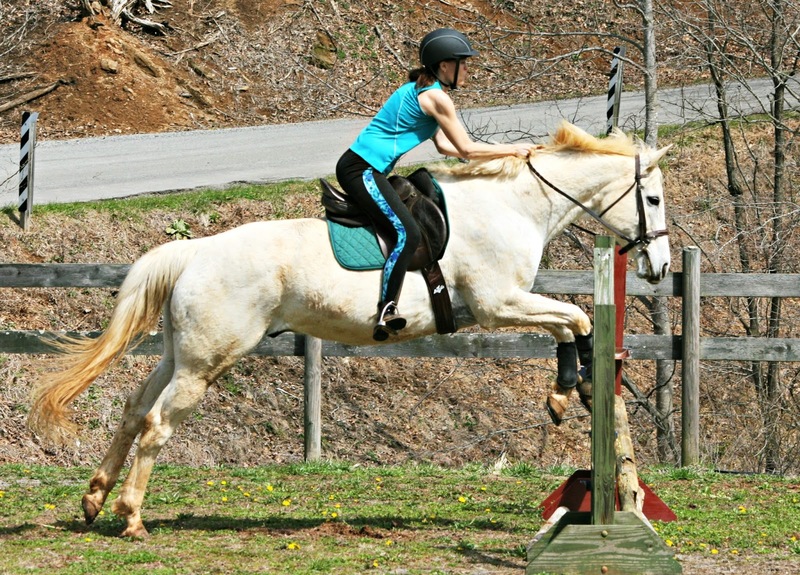 I've been taking him on trail rides, and sometimes do a little jumping. Last week I showed Pierce how to use the good camera, and he worked on getting action shots. I took three fences, and Pierce caught two of them just right. It's been a long time since I've jumped much, or worked with a trainer. It's good for me to see the pictures to pick out my flaws. I got a tad left behind on this one. Compared to Francie, he's an easy going, straightforward ride. He's very sensitive to cues - like changing diagonals or asking for leads. 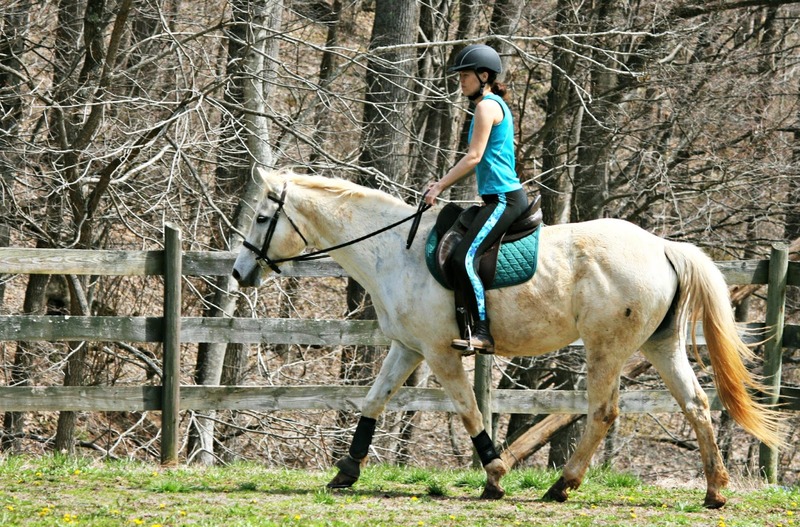 Riding him makes me feel like a teenager again. It's such a treat to ride a more finished horse. But this is the best part of it - he's gentle with the boys, trustworthy. And here's my photographer. Didn't he do a wonderful job? ...Sima has a good home! Yea!! This is happy news all the way around! Looks like Sima landed in the perfect home. So glad Sima got you and your family for his new home. :-) Pierce did great with the photos! He's very pretty, and I'm so glad it worked out! Occasionally the stars do align, eh? Looking good, he will enjoy all of the attention, I think they are like people in that working makes them feel good. Awe how very special for all of you to share your lives together. He looks like one fine horse, enjoy many years together! So happy for y'all, and Sima! Pierce does have an eye for photography. Find him a good used digital(for cheap) and turn him loose! Fantastic shots of having fun, glad to her it is working so well. He is a good photographer. You can bet next time he'll be even better! And I loved your shots of riding. I wish I could ride. I am so excited for all of you including Sima. Enjoy! Congrats to Sima! Pierce did a great job with the camera. That's so exciting! I'm so jealous you can keep horses on your property. 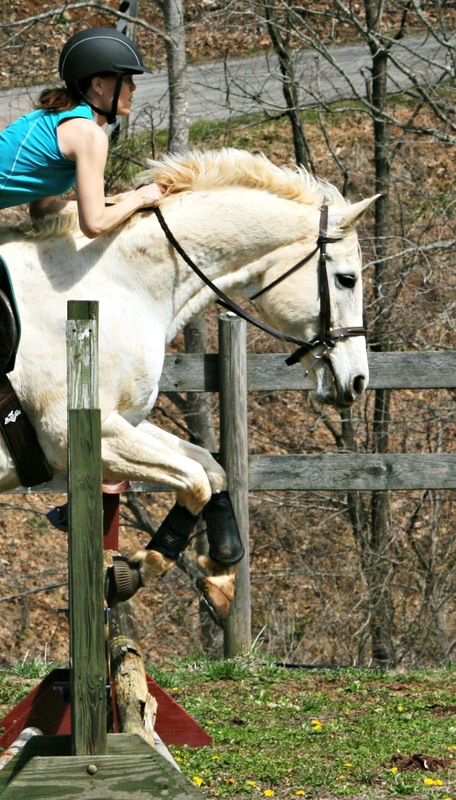 I really miss having a horse and riding daily! Such a pretty horse. I'm glad the boys get to keep Sima. Beautiful horse, and you look like a natural rider. Life is good, living on your own farm out in the woods, isn't it. Beautiful horse! Looks like he's found a great home to live at. Glad Sima worked out for all..... I'm sure the boys will soon be riding and enjoying it as much as you have . How is SIma and the boys? Enjoying themselves very much ? Sima is gorgeous!!! He looks quite content in his new home. Your budding photographer is a cutie and has a good eye! Sima is in great home indeed! Hoe I love to see all the pictures of Sima here..lucky you! Oh! 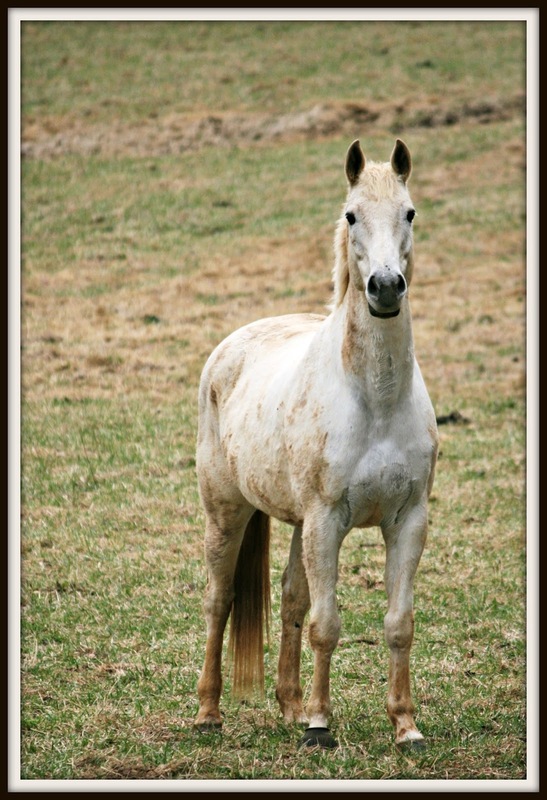 I love white horses. 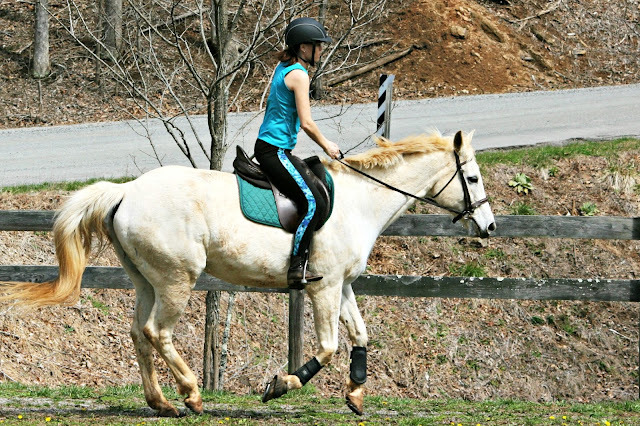 Your new horse, Sima is gorgeous! 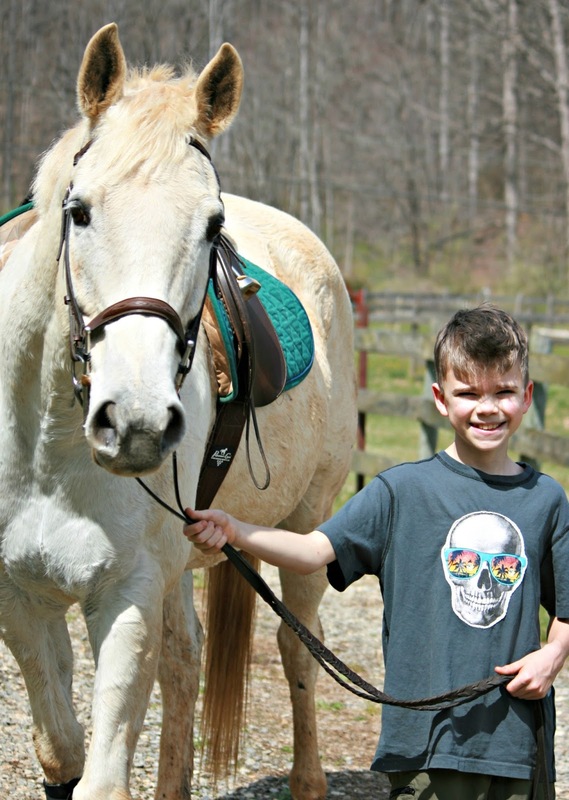 Pierce, your son, looks so happy with his new horse. I hope you all enjoy riding Sima in your bright future ahead. I love his looks, so pure white, so gentle, so unique. I love horses! Have a wonderful Summer Vacation to you all, Lisa, family, loved ones! You are indeed, all so blessed, my friend.